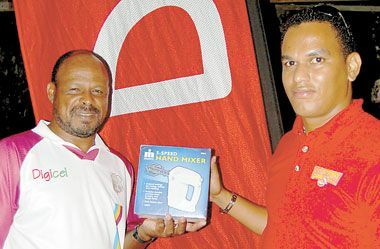 Meanwhile, the âWheel a Dealâ and Digicelâs team made a stop at Grimbyâs Shop in Rose Bank last Friday, January 20. The âWheel a Dealâ is part of Digicelâs 2011 Christmas promotion which comes an end on January 31. During the Rose Bank Road Show, persons who topped up EC$10 or more got the opportunity to win free credit and prizes compliments Singer and Aeropost. Vera Lewis won herself a Juicer and EC$40 credit, while Michael LaBorde took home a Hand Mixer. âI feel good because I got more than what I paid forâ, said Lewis. Commenting, Laborde who topped up EC$10 said that he felt nice and, âI will put my prize to good useâ. A number of other persons who topped up their handsets also won huge amounts of credit, while other prizes, including knapsacks, bandanas, caps and soccer boots, were also given away. DJ Urkel provided entertainment. Marketing Executive at Digicel Justin John said the âWheel a Dealâ seeks to reward the companyâs valued customers. âCome to Point today and get the opportunity to win free credit and great prizesâ, said John last Wednesday.